In this New York City food guide you’ll find 10 must-eat restaurants in NYC that I can almost guarantee will satisfy your taste buds. One of the greatest things about New York City is the diversity of the people; And there’s no better way to experience New York City’s melting pot than by digging into its food. If you love to eat, this guide on some of the best restaurants in NYC is for you. Note: New York City is a gigantic city with thousands and thousands of restaurants. So this list of top 10 restaurants in NYC is by all means not complete, but it’s a selection of the best restaurants I personally tried during my recent trip. If you have other favorite restaurants in New York City (not mentioned in this guide), I’d love for your to share it in the comments below. Easily one of the most famous New York City restaurants, Katz’s Delicatessen is an institution that has been serving classic sandwiches since 1888. 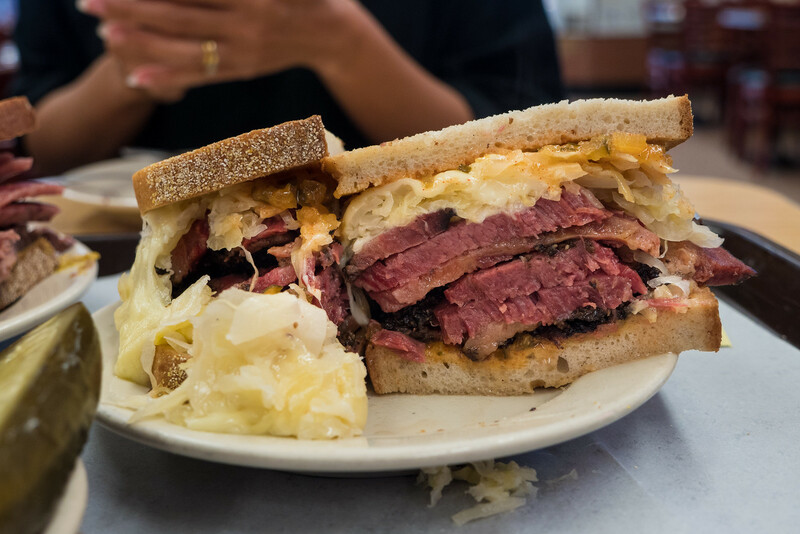 Although they have a variety of foods on their menu, the single reason you should eat at Katz’s Deli is for their pastrami. The pastrami is sensational, fall apart tender, with a perfect ratio of fat to meat, and a crust of black pepper and secret spices. It’s everything you could want in pastrami. When you enter Katz’s Delicatessen you’ll be handed a little yellow ticket (make sure you hold onto this and don’t lose it or they will charge you, seriously). Take the little yellow ticket and go to the bar-style counter and hand it to a cutter. The cutter will take your order, and fix your sandwiches. Oftentimes your cutter will give you a sample of the pastrami as he’s making your sandwich. It’s expected that you give your cutter a tip. Then you take your sandwich, sit down at an empty table, and sink your teeth into a ridiculously thick meat sandwich, and enjoy every single bite of it! When I ate at Katz’s Delicatessen, my wife and I ordered the reuben with pastrami, and a half corned beef, with a side of coleslaw and a plate of pickles. The corned beef was alright, nothing special for me, but the reuben pastrami was insane. Also, I didn’t care for the coleslaw as it was quite sweet, but the kosher pickles were excellent. 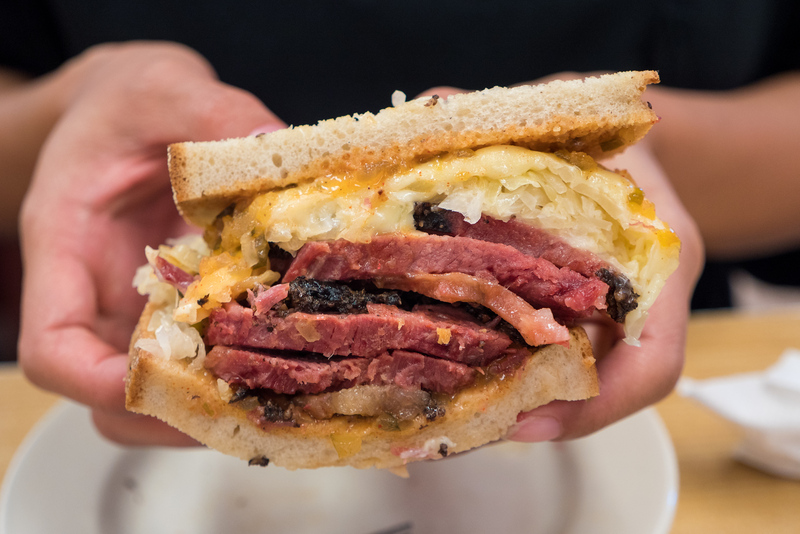 Expert eater tip: If you go for lunch, Katz’s Deli is known for being crazy busy. So if you’re up for it when you’re in New York City, go for breakfast, after they open at 8 am. My wife and I were there just after 8 am, and we nearly had the entire restaurant to ourselves (plus we had the rest of the day to burn off all that pastrami). Open hours: 8 am – 10:45 pm on Monday – Wednesday, 8 am – 2:45 am on Thursday, 8 am – all night on Friday, open all day on Saturday, 8 am – 10:45 pm on Sunday. Prices: Katz’s Deli is very expensive, there’s just no other way to put it – $20 for a sandwich!!? But I guess you pay food and legend. My total bill came to $48.56. How to get there: The restaurant is located in the Lower East Side of Manhattan. I took the subway to 2nd Ave station, and it’s just a five minute walk down Houston St. to Katz’s Deli. As I was rummaging my chopsticks through the beauty that is the “Spciy Big Tray Chicken” at Spicy Village restaurant, I caught a glimpse of an article written by the New York Times posted on the wall, written all about Spicy Village and especially focused on the dish I was about to devour. 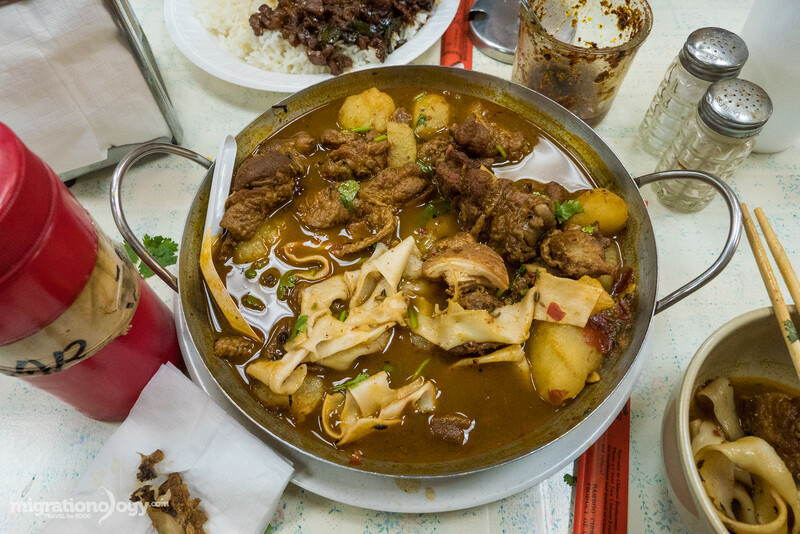 Spicy Village is a tiny restaurant located in Chinatown in Manhattan that specializes in home-cooked style dishes from the central Henan province of China, plus some extra dishes that have roots in Xinjiang – the Spicy Big Tray Chicken being one of them. It’s an incredible combination of flavors! If you’re a spicy food fanatic, and love cumin, food can hardly get any better than the Spicy Big Tray Chicken. 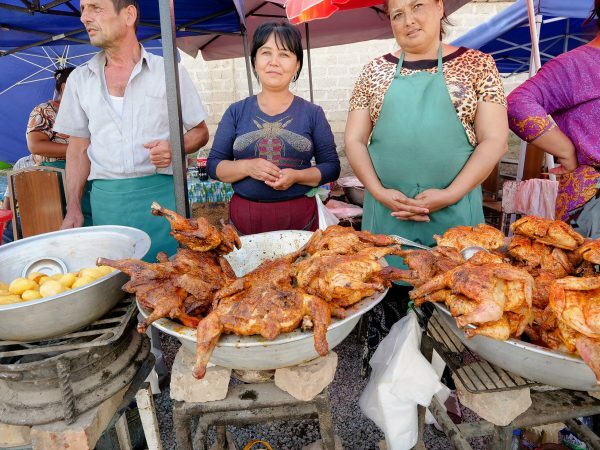 Again, the chicken is deep fried in a unique concoction (that includes beer), then braised in a spicy chili, cumin, and Sichuan pepper soup. I ordered it with hand-pulled noodles, which went with the dish perfectly, but rice would have been equally as good. I included Spicy Village on my list of best restaurants in NYC because the powerful flavors and the friendliness of this little restaurant are standout. Big thanks to Monty in NYC who recommended Spicy Village, saying it was a restaurant I’d be sure to love. Prices: The Spicy Big Tray Chicken which was serve two costs in the $14 range. 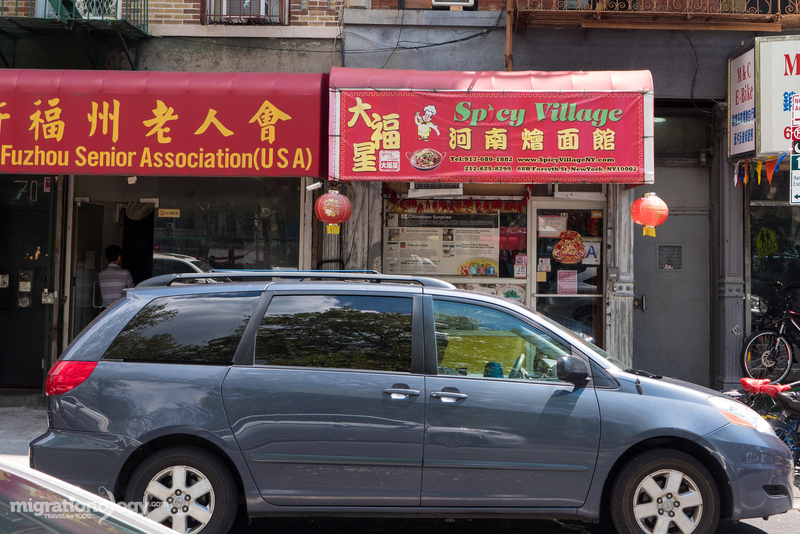 How to get there: Spicy Village is located on the edge of Chinatown, a few minutes walk from Grand St. subway station. When you think about food in New York City, pizza is probably one of the first foods you think of; Not eating pizza in NYC would be the same as getting into a car and not going anywhere – you simply do not do that. In any New York City travel or food guide, you’ll find dozens of legendary pizza restaurants like Lombardi’s, which is one of the first pizzerias in America, and Grimaldi’s which is known for their coal brick oven pizza. But when I asked where to go for the best pizza in New York City, I got an overwhelming answer to try Di Fara Pizza in Brooklyn. 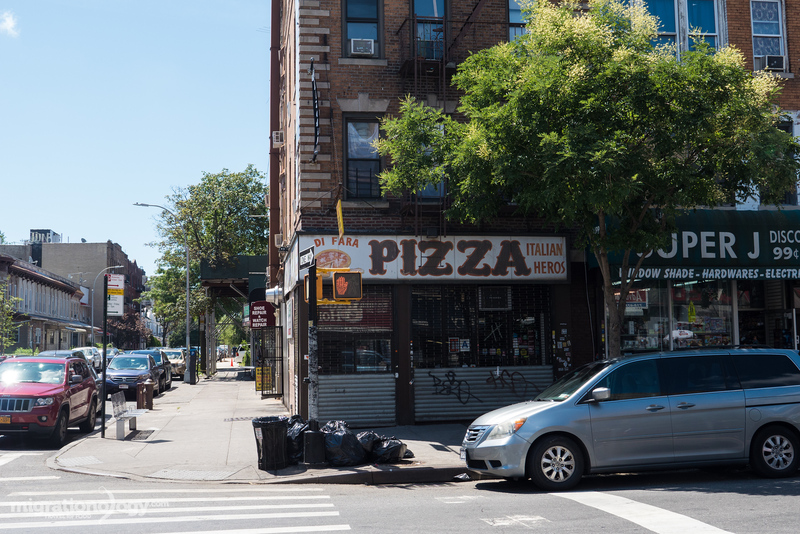 Long known, especially among the food obsessed of New York, Di Fara Pizza is a small family run restaurant owned by pizza making legend, Domenico DeMarco (and now his family as he’s getting quite elderly). In this article on Business Insider, DeMarco explains that one of the reasons why their pizza is so good is because their ingredients, including the tomatoes and cheese, all come directly from Italy. One day on my food trip to New York City my wife and I decided to take a food mission to Brooklyn, stopping first at Di Fara Pizza. We arrived about 20 minutes before they opened at noon, and I was lucky to be first in line for the day. 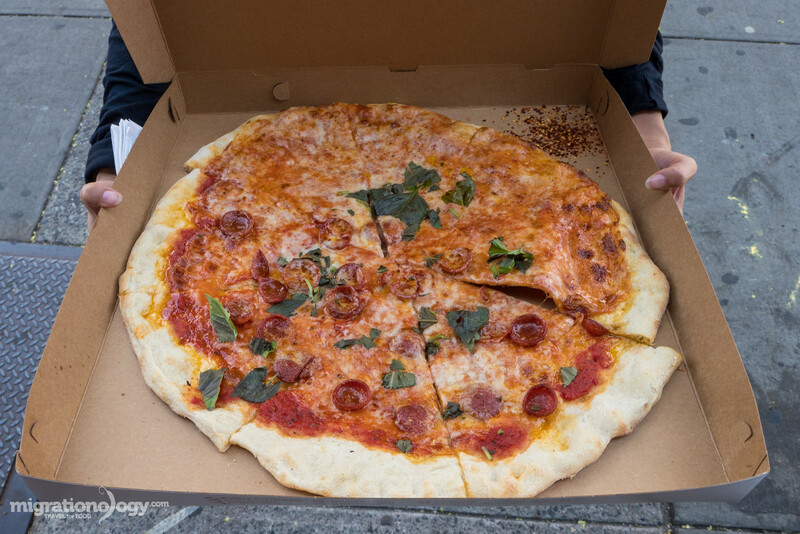 After much contemplation, and reading this post from Serious Eats, I finally decided to order the classic thin crust round pie, with half only cheese and half with pepperoni. Yes, you do want to look at your pizza up this close. I put in my order, and after about 15 minutes my pizza came out of the oven, the cheese sizzling and nearly sliding around on top of the pie. What I loved most is that they scissor cut on some fresh basil right on the top of the sizzling cheese before serving it. Words are hard to describe how good and how simple tasting the pizza at Di Fara Pizza was. The crust was thin and crisp on the bottom, gooey on the inside, with a slight sweet and slightly tart tomato sauce, a perfect layer of cheese, and that fresh basil to give it the extra touch. Prices: Prices at Di Fara Pizza are known to be kind of ridiculously expensive. I paid $31 for my full pizza, or if you’ll pay $5 per slice. How to get there: Di Fara is located in Brooklyn. I took the subway from Manhattan all the way to Avenue J station, which took about 45 minutes, and the restaurant is literally across the street from the exit of the subway station. What could be so good about chicken over rice? That’s what I thought to myself before ever eating at The Halal Guys, one of the original New York City street food carts. Their food is Middle Eastern inspired and they serve Halal food as their name pretty clearly suggests. “Make sure you get a lot of sauce, both the white sauce and the red chili sauce,” are what many people told me about eating at The Halal Guys. One night in New York City, my wife and I walked through Times Square and we were thinking of places to eat when I remembered the original The Halal Guys was not too far of a walk away. We went to the location, right across the street from the Hilton Midtown hotel. I ordered the chicken over rice, which came in a foil container with a base of orange colored rice, topped with a layer of semi-shredded chicken on top, some iceberg lettuce, and a few pieces of bread on the side. Since I ordered for takeaway, I got the white and red sauce in little packets on the side. First, I decided to try the chicken and rice on its own. It was pretty plain. Then I squeezed on the white and red sauce. Let me tell you, when it comes to The Halal Guys, it’s ALL about the white and red sauce. That’s where secret of flavor lies and the explosion of taste is. 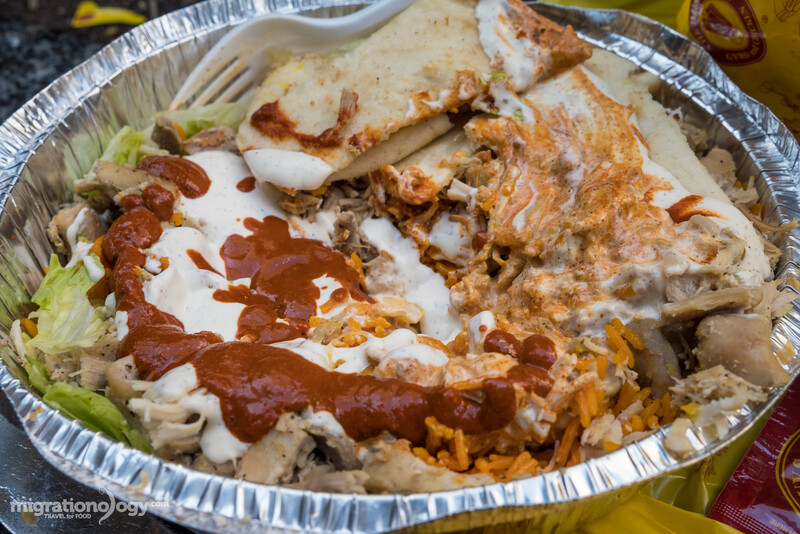 The swirl of creamy white sauce, and the spicy chili filled red sauce, drenched over the chicken rice is the only way to eat The Halal Guys. Expert eating tip: Whatever you do, don’t under-do the sauce. Seriously, The Halal Guys is all about the sauce. Open hours: 10 am – 4 am daily, one of the late night restaurants in NYC when you need a huge meal at 3 am! 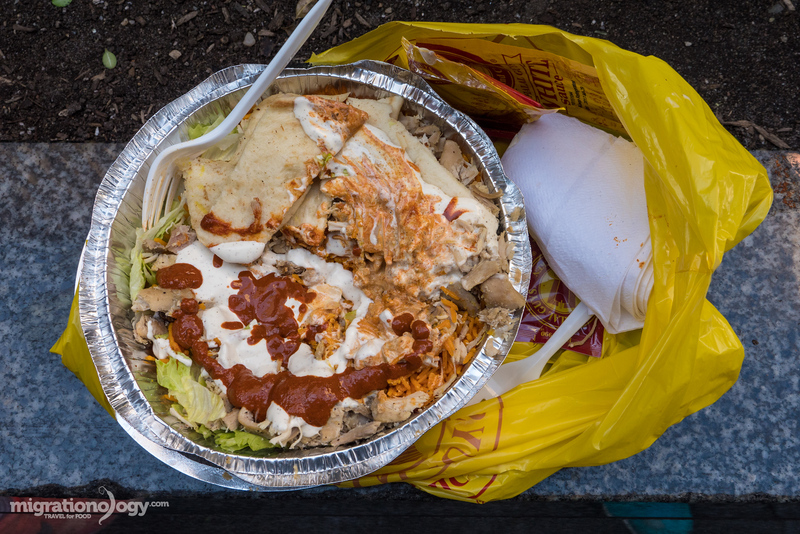 Prices: For New York City, The Halal Guys is one of the best places to eat in NYC on a budget, and for the how full you’ll get to the price ratio, it’s a good deal. The chicken over rice cost me $7. How to get there: Probably the closest subway station is 7th Ave, but you can also walk from Central Park or anywhere in Midtown. 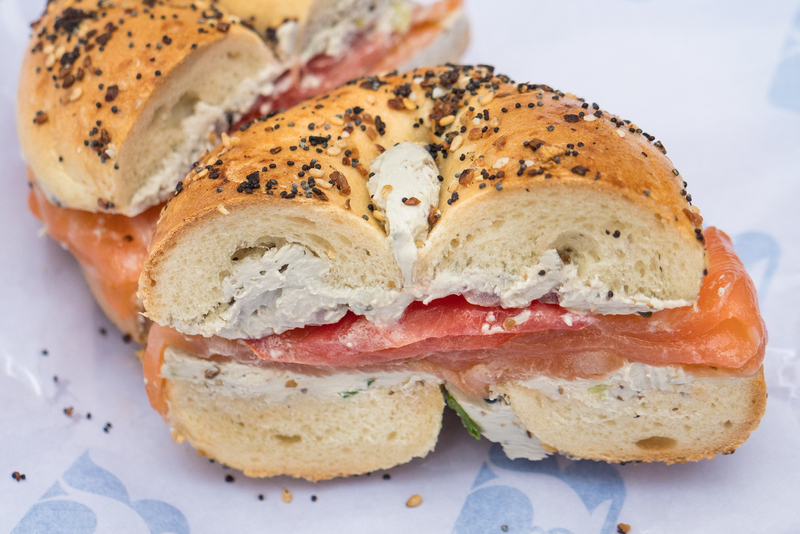 Russ & Daughters is one of the most famous New York City restaurants for serving all types of salmon, both smoked and salt cured, with bagels and cream cheese. They also have a pretty extensive selection of other delicious foods like herring, salads, and dried fruits and nuts. When I arrived to Russ & Daughters on a morning at about 10 am, the line was out the door. But it didn’t take more than five minutes for me to get inside and take a ticket. It was standing room only, but after about 15 minutes my number was called (which happened to be just the right amount of time for me to decide what I wanted to order). Many of the terms are various ways of preserving salmon with Scandinavian origins. Gravlax is the term used for cured salmon, usually in salt and sugar. 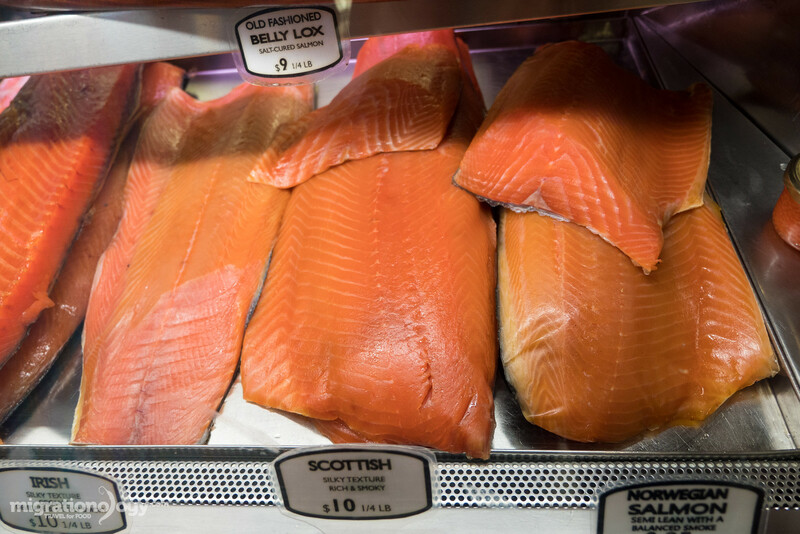 Another common salmon at Russ & Daughters is belly lox, with is salted cured salmon belly, known for being fatty and very salty. Lucky Peach published this great guide about the different types of salmon you’ll find at Russ & Daughters. Despite wanting to order a selection of different salmons, my budget wouldn’t allow. So I chose an everything bagel with Scottish smoked salmon, caviar cream cheese, with tomatoes and onions. The smoked salmon bagel was much smaller than I had anticipated. However, the taste quality was superb. The salmon literally melted in my mouth and was nearly the same texture as the thick layer of caviar cream cheese which was spread on both sides of the bagel. 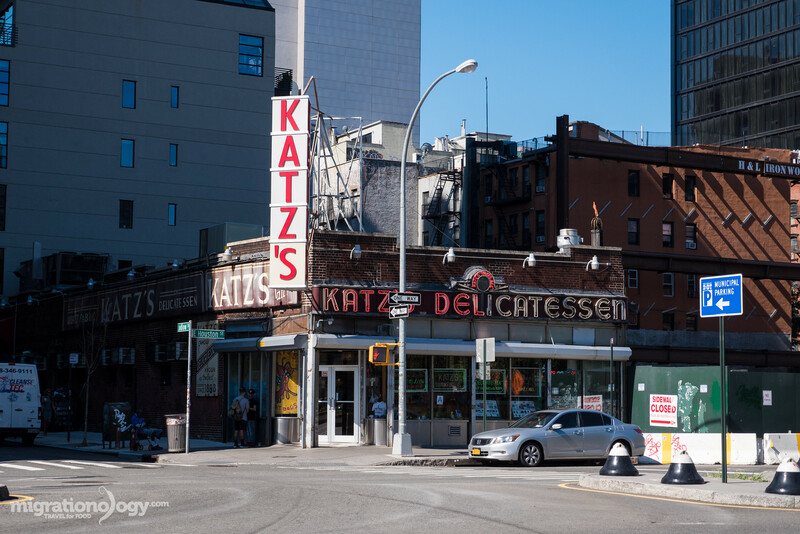 Similar to Katz’s Delicatessen, although the food is of excellent quality and bound to satisfy, it’s by all means not one of the budget restaurants in NYC; You pay extra for the legendary status of the restaurant. Open hours: 8 am – 8 pm on Monday – Friday, 8 am – 7 pm on Saturday, and 8 am – 5:30 pm on Sunday. Prices: I had a classic sandwich for $13.88. Believe me I had to take that one sandwich and run, for fear that if I hung around longer, I would rack up a $100 bill. 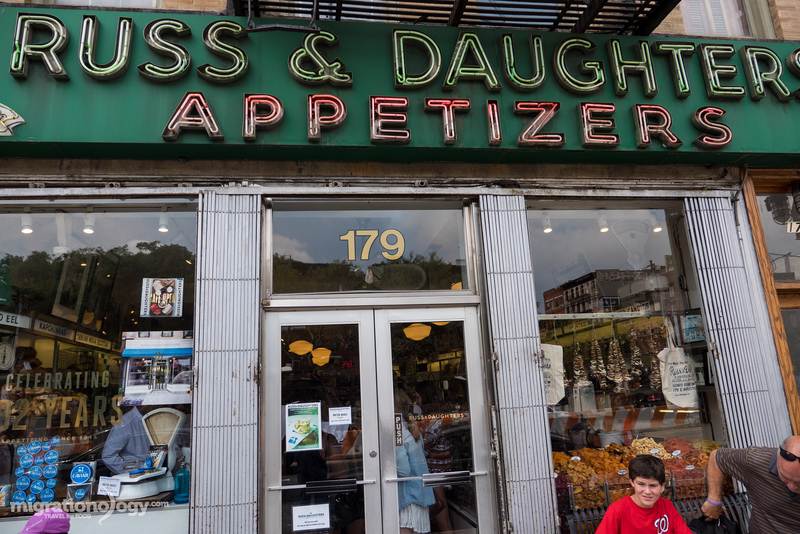 How to get there: You can get to Russ & Daughters from a number of subway stations depending on where you are in New York City, but I took the subway to 2nd Avenue station and it’s about a 3 minute walk from there. 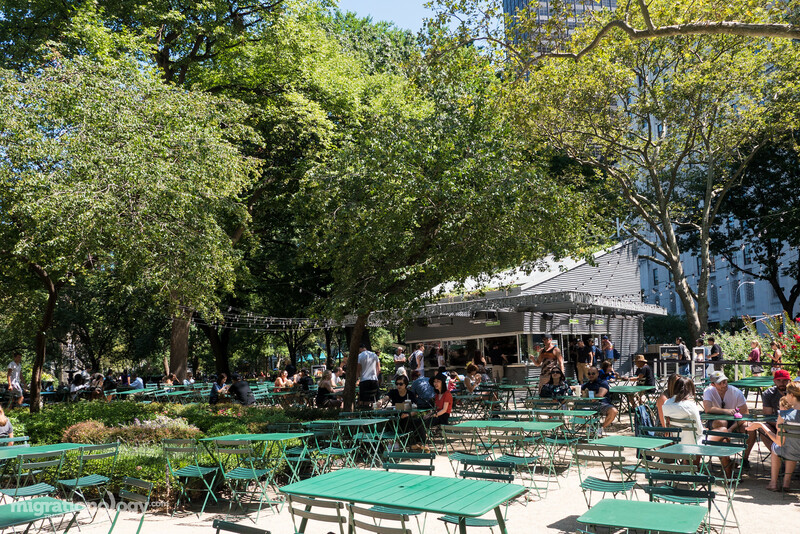 Along with more famous New York City restaurants that have become institutions in the city, NYC also provides you with the opportunity to sample cuisines from around the world. Ethiopian food happens to be a personal favorite of mine, and when I was in NYC, I met up with my good fried Sarah from OHK World, and she took me to one of her favorite Ethiopian restaurants in the city: Meske Ethiopian Restaurant. Not only is Ethiopian food delicious, but the family style of eating together, is what truly makes it a great experience. On the menu you’ll find both a meat or a vegetarian combination platter which includes a variety of special dishes, which all come on top a tray of injera (which is a pancake like sour bread made from teff flour). I’d recommend ordering a mixed combination of your choice, plus a few extra dishes like special tibs and/or doro wot (an Ethiopian stew of chicken, egg, and lots of berbere). Meske serves excellent Ethiopian food and is one of the restaurants in NYC in this guide that also has many vegetarian options. Prices: There were three of us, and we had a pretty significant meal plus drinks and our bill came to about $90. You’re looking to spend about $30 per person. How to get there: Meske is located in Hell’s Kitchen a couple blocks from 50th Street station. From In-N-Out to Five Guys, the United States is hardly immune from burger wars. 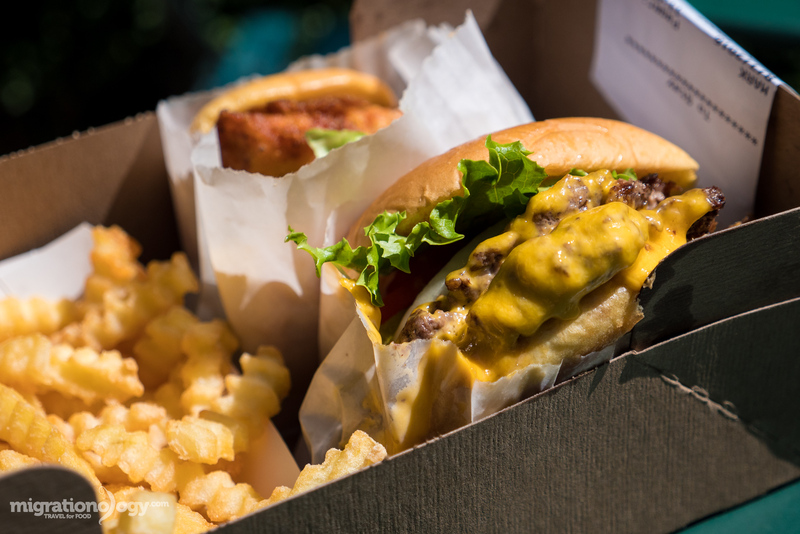 When it comes to the best burger chain in the United States, New York’s Shake Shack has been leading a burger revolution and wowing burger fanatics recently. Here’s a pretty complete burger chain taste test comparison on Serious Eats. 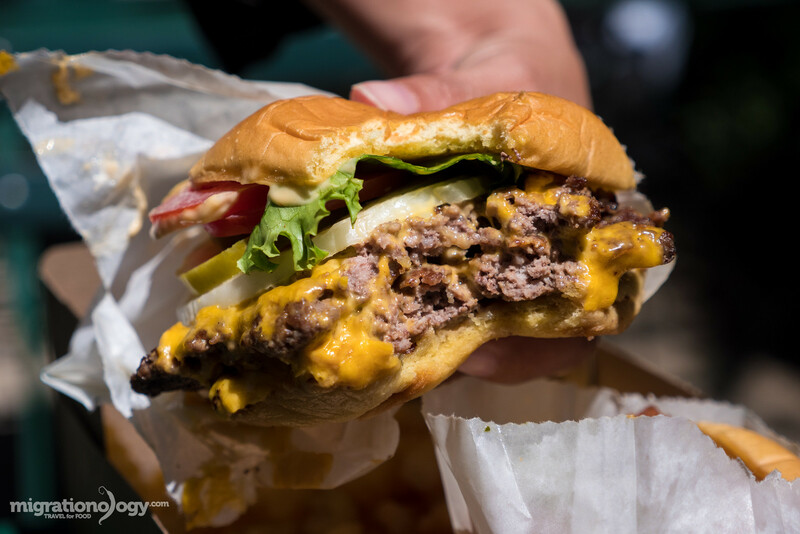 I honestly normally prefer fresh hand-made burgers over fast food burgers, but when passing though Madison Square Park (the original location of Shake Shack) I couldn’t resist trying one of the most famous burger chain restaurants in NYC to see what it was all about. The menu includes burgers, hot dogs, and shakes, and I decided to go straight for the Double Shack Burger with a side order of fries. Burger meat – The beef is a combo of short rib, sirloin, and brisket which is always fresh and never frozen. I liked how the burger was not a fine grind. Bun – The bun is a potato roll which is very soft and toasted in butter before being compiled. Cheese – The only thing on the Shake Shack burger that I didn’t care for, or thought could improve was the cheese. It had that processed plasticky taste to me. I won’t deny, I enjoyed every bite of my Double Shake Shack burger down to the last drip of beef grease. Prices: My Double Shack Burger cost $8.09 plus $2.99 for regular fries. I think they are pretty average prices for NYC fast food restaurants. How to get there: You can get to Madison Square Park the quickest from 23rd Street subway station. 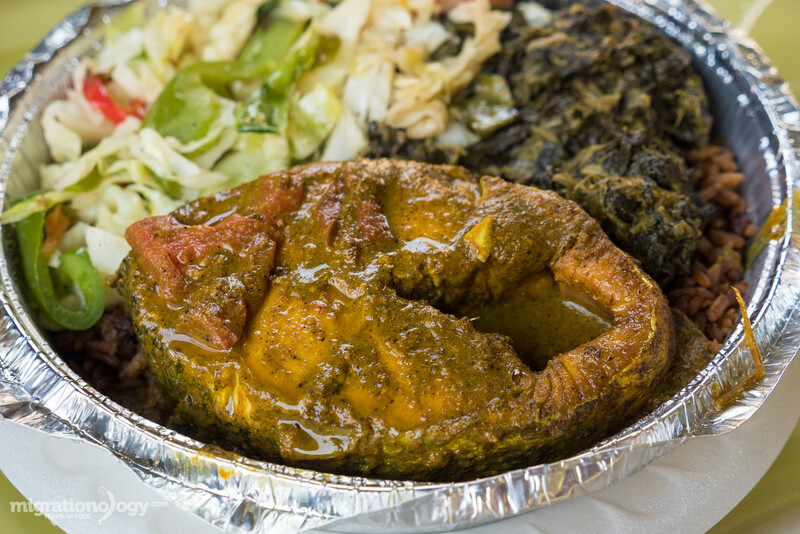 Gloria’s Caribbean Cuisine, located in Crown Heights, Brooklyn, serves a mix of Caribbean food, most of which is Trinidadian. 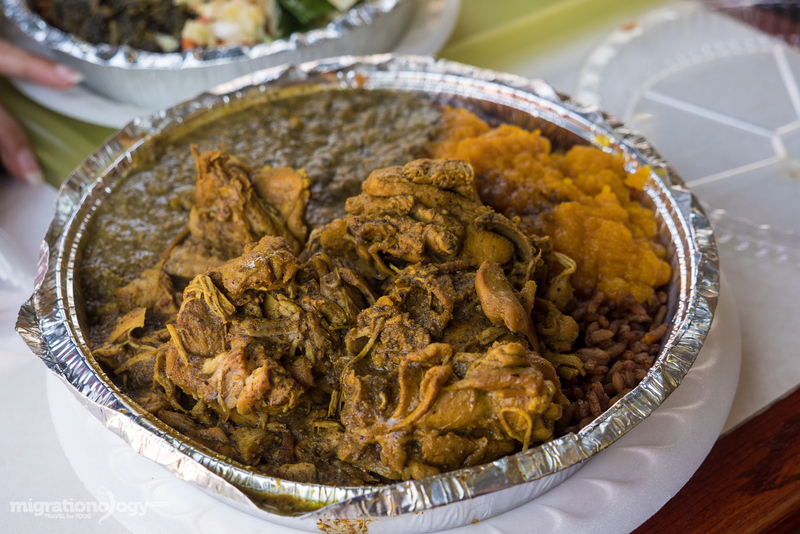 For incredibly delicious curries and friendly service, Gloria’s Caribbean Cuisine is one of the restaurants in NYC you don’t want to miss. On the menu you can order a good variety of different curries paired with side dishes, and they also have rotis and doubles (a Trinidad and Tobago fried flatbread sandwich). When my wife and I ate at Gloria’s Caribbean Cuisine we ordered two plates, one with curry chicken and the other curry fish, which both came with a number of vegetable sides and rice. From the moment I lifted the lid on my to-go foil container, and that cloud of steam filled with the aroma of spices hit my nose, I could hardly contain my excitement. The taste of the curries are just as good as they smell. The only thing I regret is only ordering a curry plate without trying the doubles. So next time I eat at Gloria’s Caribbean Cuisine I’ll be ordering a couple doubles straight away. Prices: The large sized plates cost $11 – $14, but the portion sizes are huge and well worth it. 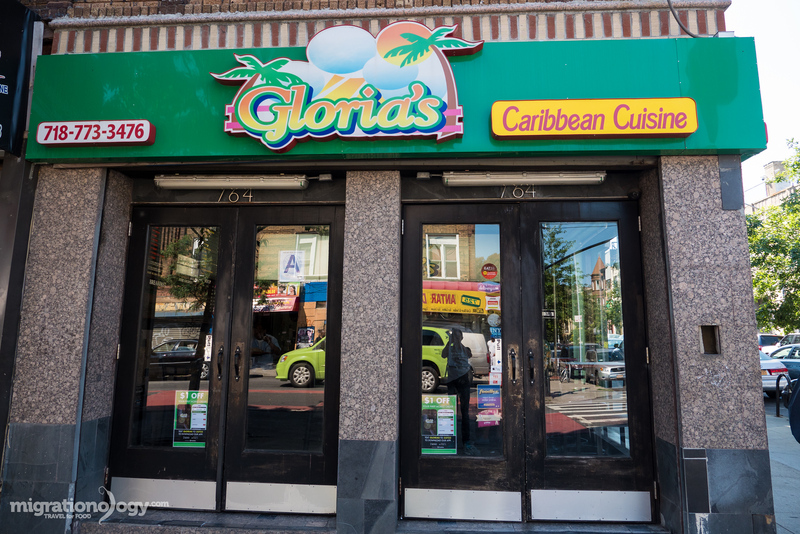 How to get there: To get to Gloria’s Caribbean Cuisine in Brooklyn you can take the subway to Nostrand Ave station and it’s about a 10 minute walk from there. With multiple locations around New York City, Xi’an Famous Foods specializes in serving flavors from Xi’an, a city located in the northwestern part of China. 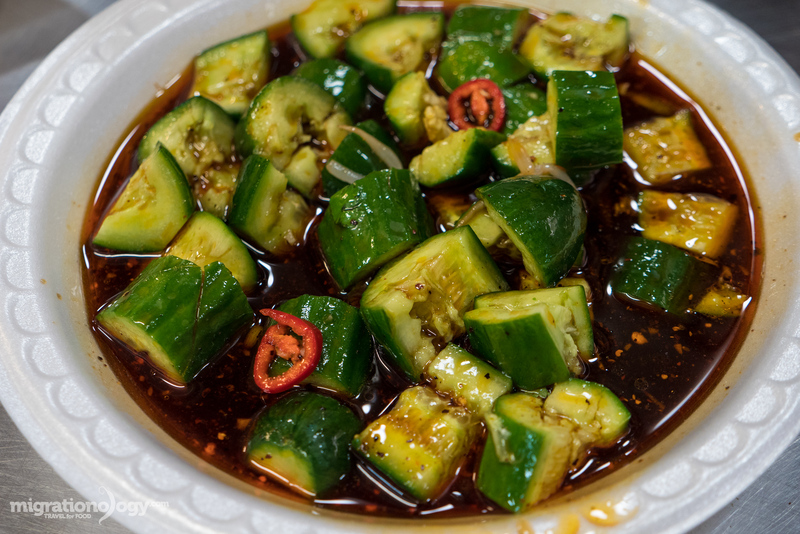 Unlike Chinese Cantonese food, Chinese food from Xi’an is more heavy on spices, namely cumin, chilies (and plenty of chili oil), and Sichuan pepper. When it comes to restaurants in NYC, Xi’an Famous Foods is one of my personal favorites. I could probably eat something off their menu everyday and be very happy. 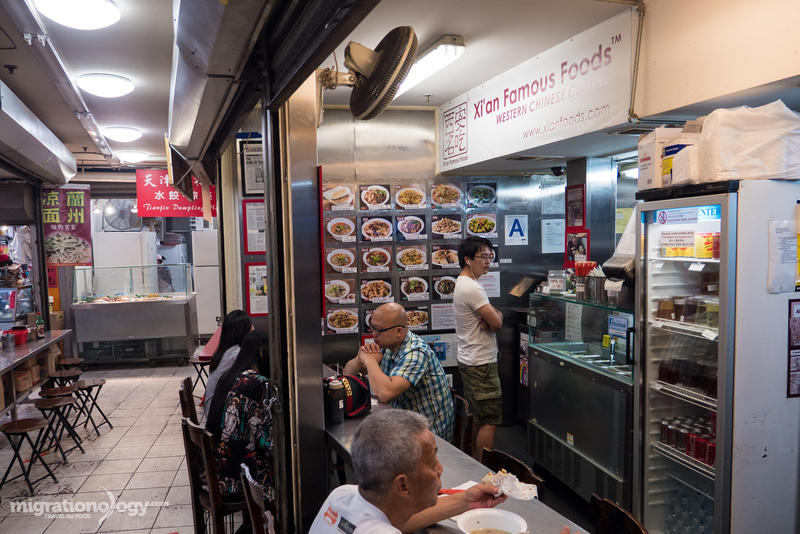 Like I already mentioned above, you’ll find convenient locations of Xi’an Famous Foods around NYC, but I decided to make the trip from Manhattan to Flushing to visit the original location, tucked away down in the bottom basement of the Golden Shopping Mall. The food center in the bottom of the mall is beautiful, it literally feels like you’ve traveled out of New York and straight to China. 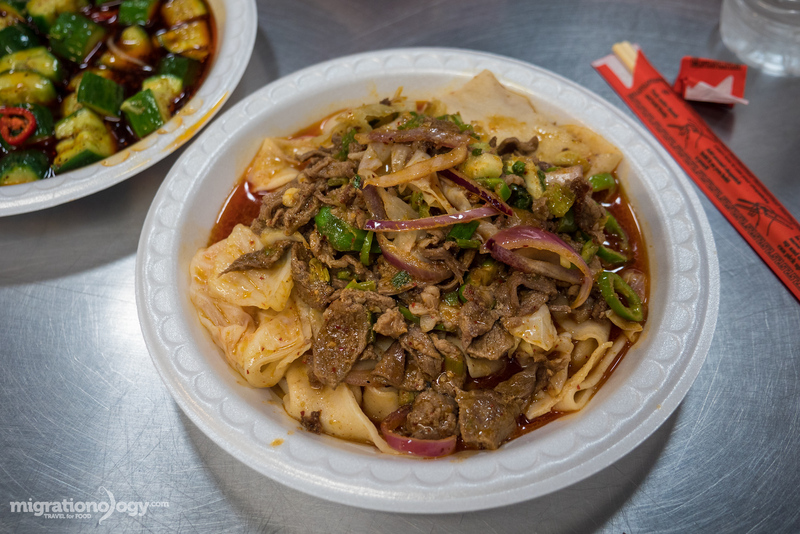 Despite wanting to order the entire menu, since there were a few more restaurants I wanted to eat at in Flushing, I decided to keep it simple and order a plate of spicy cumin lamb hand-ripped noodles and a side of spicy Asian cucumber salad (see the full menu here). The noodles were everything I had hoped for, gooey and thick, and soaked in their exquisite secret chili oil and Sichuan pepper blend. The lamb just made things even better, but I would have been seriously happy just with the noodles and chili oil! 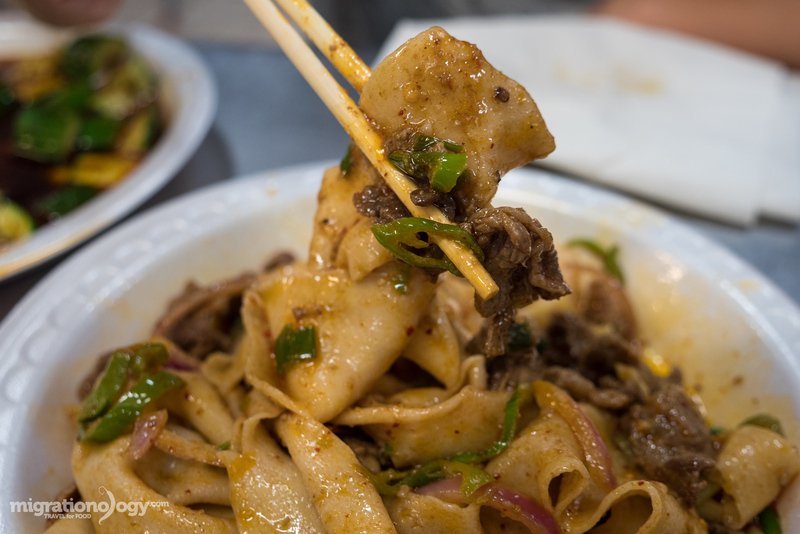 Prices: Hand pulled plates of exquisite noodles cost in the $7 – $9 per plate range. How to get there: Take the NYC subway to Flushing Main Street station and it’s about a 5 minute walk over to the Golden Shopping mall. Head directly downstairs and start eating. After graduating from University in the United States, in 2009 I decided to travel to Southeast Asia, and I never moved back. And as much as I love Thai food, one of the only main cuisines I really miss living in Bangkok is Mexican food. It’s not the Tex-Mex type of food that I miss, but it’s the real proper tacos where you can taste the meat, the smokiness, and the fiery dry chilies in the salsa. After doing some extensive research on restaurants in NYC that serve Mexican food, especially Mexican style street food, I came across Los Tacos No.1 located at Chelsea Market, and immediately knew it was a restaurant I needed to try. 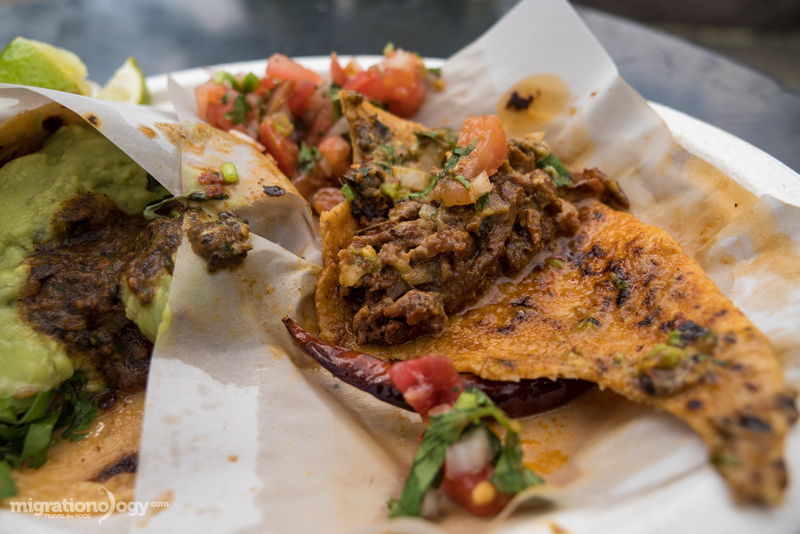 If you’re looking for some of the best tacos New York City has to offer, and possibly equally as good as tacos elsewhere in the United States, Los Tacos No.1 will satisfy your every need. This is exactly what I want to see part way through a taco. I ordered one of each of their tacos: adobada, carne asada, pollo asado, and nopal. You can then choose to have your tacos with corn or flour tortillas, and I ordered two of each. The tacos are decorated with cilantro, onions, and guacamole, and you can add your own salsa, extra dried chilies, and lime wedges to squeeze on top. For taco lovers Los Tacos No.1 is one of must eat places in NYC. 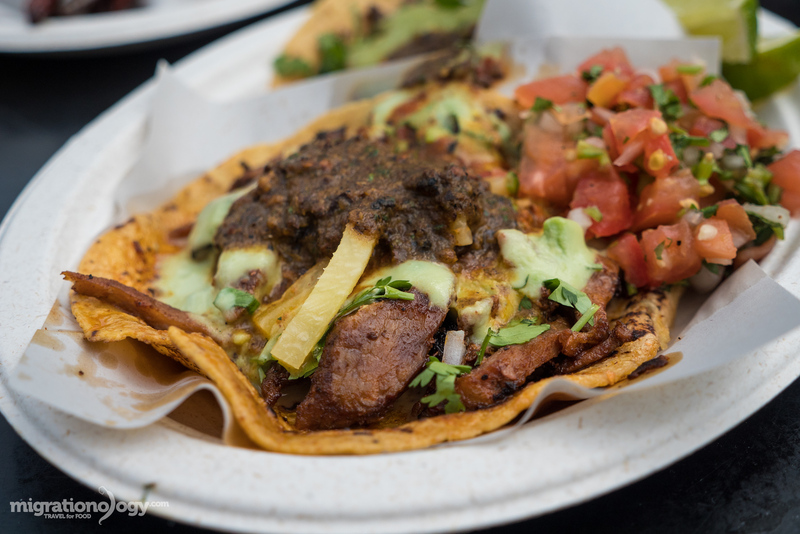 All the tacos were good, but the best was the adobada, cooked on a doner that reminded me of Istanbul, on a corn tortilla with all toppings and extra salsa. Prices: I ordered four tacos and my bill came to $14 which isn’t by any means budget or cheap, but it’s pretty typical prices for restaurants in New York City. 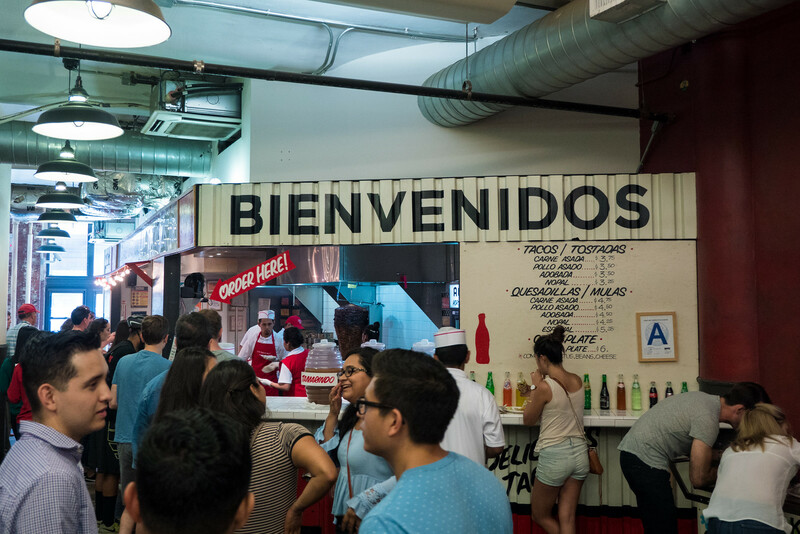 How to get there: Los Tacos No.1 is located at Chelsea Market, which is a five to ten minute walk from 14th Street subway station. On the map there are a few extra restaurants as well, but the restaurants listed in this guide are 1 – 10 on this map. 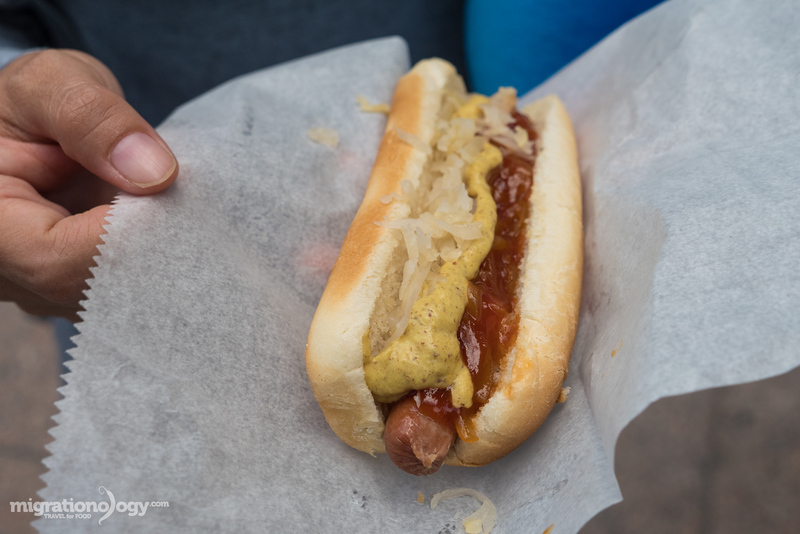 Hot dogs are good, but there’s so much more to eat in NYC! There you have it, 10 of the top restaurants in NYC that I ate at during my visit to New York City. And finally again, I just can’t stop thinking about the diversity of New York City, the people that call it home, and the melting pot of delicious food available. By all means don’t limit yourself to only the 10 restaurants included in this New York City food guide, but I hope it gives you some ideas of must-eat restaurants in NYC that you don’t want to miss! 182 comments. I'd love to hear from you! All of the food on this page looks amazing. Especially #9 on the list! Yes – as soon as I touch down in NYC I drop my bags and head to the X’ian Chinatown location for the lamb dumpling in that fantastic chili broth – not so hot/spicy, but so intense spicy. Hey Mark, I’m right now in New York City, will definitely try on your recommendation!! Thank you for sharing! Good luck Yan, that city is amazing. Have a nice trip, and all the best for 2019. Hey Mark, I’m going to New York from May 24-29! I will try Xian Famous Food! Mmmmm bookmarking this page! I need to try all of these! Thanks for your post . I love the variety of food. 6/10! Must eat at those other restaurants! So happy Gloria’s made it to this list! Tastes like home-cooked food at its finest. As much as I love your post and as much I respect Shake Shack’s burgers, I would put the burger at Emily’s in Brooklyn in my New York must eat list. It’s more expensive and harder to find because they make a limited number of burgers there, but it’s worth it. What do you think? Have you been there? I just got back from NYC, having spent about a year there and you’ve encapsulated most of my favourite eats – the halal carts, the Caribbean food, lox, the pizza! Every New Yorker has their own favourite spots of course! I’m glad you included Shake Shack as that’s one of my absolute favourite spots for a burger, and I miss it! These all sound amazing – love the variety of food in NYC! Spicy Village it is!!! I’m not much of a foodie but hey, I love me a great meal. And that Spicy Big Tray Chicken looks like the meal I’ve been missing in my life! The next time I’m in NYC, I must visit the restaurant. Thank you so much for this. Cool to hear that Naomi, hope you enjoy it! Thank you very much Karen, and thanks for the extra restaurant recommendations. Would love to go back to NYC! Thanks For Your valuable Guides. Hey Mark, my girlfriend and I both really love your reviews and restaurant choices. She is French and I’m an American transplanted to Paris and I’ve been here eight years. l think you should do a video on some of the great food in Paris — not the MIchelin-starred places, which are of course great, but all the much admired and beloved places that the locals go to, much like your selection of places in NYC (where I went to school and where we’re going in October). What do you think? We’d be glad to make some suggestions. By the way your suggestions for Lisboa were GREAT and we had a great time there two months ago. Thanks so much! Great selection I feel hungry! Including the map is an awesome idea. As a lifelong NYer, you did my city proud by not only hitting the namesake touristy places, but also the hole in the wall joints like Gloria’s and the Ethiopian spot. Come back soon. Hi guys, great videos. Next time you go to NYC. I recommend to visit Koreatown and check out Miss Korea. A great Korean BBQ restaurant, order an assortment. Also visit the Ansel Kitchen for the most awesome fluffy cheesecake made from Creme Fraische, rather than tradition cream cheese. My God, it’s delicious, I really love it. I am getting hungry when I’m saw the picture. if it real, I’ll eat it now. 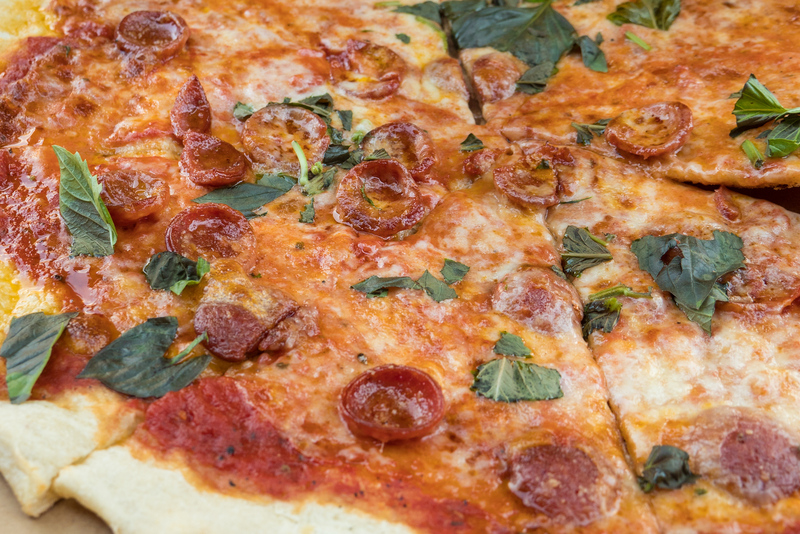 No place makes a pizza quite like NYC … simple yet amazing! Katz didnt close, Carnegie Deli did. Hey Ankit, awesome, thank you for sharing! I would like to try Los Tacos. I have always love tacos and I have tried many of them already. Want to go here and see if it is far the best. Wow. I will definitely wanna try out Gloria’s Caribbean Cuisine! Thanks for the information! Happy New Year to you as well! Have a great 2017! Mark, remember to try the spicy noodles from “Lao Ma Ma La Tang 老妈麻辣烫” should you ever encounter it somewhere. It is probably the best I have eaten in my more than eight years of residence in Flushing. Definitely pricey to eat in NYC, but you get what you pay for in these joints … excellent post! New York City is definitely a place on my travel bucket list, and I am also a HUGE food lover. Especially street food! Thanks for sharing. Wow! You sought out a lot of fantastic places! We love trying the local fare when we travel and with a place like NYC you can find every type of food in one spot!! The last visit we tried Milos and the food was fantastic – a real treat! Wow! I am a foodie myself, so thanks a ton for sharing, will definitely try out these.Very well drafted. Great advise and Guide.Thank you so much for sharing the details of every eating place you visited, which certainly will help us in our foods hunting mission whenever we’re in the city. Hi Mark! Congratulations once again for your newly born baby boy. Thank you so much for sharing the details of every eating places you visited which certainly will help us in our foods hunting mission whenever we’re in the city. Hope you’re always doing great and never stop sharing your vlogs. Have a great day ahead! Thank you for the great list. I love it! WOW. Thanks Mark for sharing. Everytime I watch your video, I can’t stop eating as well in front of my laptop 😀 Soo, I will visit NYC in 2019 insha Allah! I can cross off 4 places out of 10! Yei! Russ & Daughters is probably my favorite, just can’t get enough of their bagels with cream cheese and salmon. Thank you for sharing, Mark! If you love Mexican Cuisine, definitely give Cosme a try next time. Its in the Flatiron District. They have amazing food and cocktails, it will not disappoint! Mark, can you suggest some hotels that i can stay in a budget . May i ask which hotel you stayed in. Thanks. I feel like if you ever get a chance to come back to NYC, you should spend a little more time on Brooklyn. Surprised L&B was not featured. Along with L&B, Rollin Roaster, and Leonis Delhi would have also been good features. Hope you had a good time, and hope you come back soon! Gosh! I’m hungry. Ethiopian dish remind me of some E-sarn dish in Thailand. The same arrangement. 10 Great choices. Thanks again and again. Hi Mark , I just love your site. Your Thailand food reviews are fantastic . Nice to see you’re getting International now. More power to you and the success of your site.You have such a nice lovable personality. How about a TV show? Awesome list! Very inclusive of every neighbourhood and palette. I would respectfully give Ipudo Ramen an honourable mention here too! All were mouth watery foods…it seems delicious and very tasty. Many thanks for sharing, Mark. New York is in my list for the year 2017, God Willing! Hey Jojo, you’re welcome, thank you for reading. Great to hear that! I was living in New York for 15+ years, been going back every now and then to visit friends and family. Been to some places that you’ve visited. Glad you and Ying had a great time. Truly New York is a city u can’t forget. Hope you will visit Chicago too. Hey Erlina, great to hear from you, thank you very much. I’m hoping to visit Chicago in the future as well. How much do you recommend to tip the cutter at Katz? Hey Joey, I think anywhere from $2 – $5, but depending on how much you order. Probably 10 – 20%. Hey Matthew, great to hear from you, and fantastic that you’re from Trinidad. That was an amazing meal, made me so interested to visit Trinidad. I will for sure ask for heavy on the pepper sauce! As a native NYer – I am very impressed with this list. Plan to be in NYC in 2017. Will keep your recommendations in mind while I shop for food. Is it OK to eat many of the food you describe with my hand? Your passion for food is amazing!!!! Merry Christmas. Hi P.S. thank you very much. Yah, I think most of these foods however you like! Hey Heidi, great to hear that you’ll be going to NYC soon. Hope you have a great trip and enjoy the food. Fantastic as always Mark, if only NYC wasn’t a transatlantic flight away. Thank you so much! P. S. Congratulations on becoming a father! I haven’t been to New York yet but I know that on my list would be a NY deli (whatever the price lol! ), a hotdog, an American-style pizza, Asian food, and probably a meal from an obscure East European nation! And lots and lots of cocktails! Hey Victoria, thank you for reading. Hope you can visit New York in the future for some of these foods! Those were good food. Very good choices. Thanks, next year trip there. Do you have any choices for Seattle for 2017 in July! Hey VT, thank you. It’s been quite a while since I’ve been to Seattle, so I don’t have any list, but I’m hoping to go there again. They do have very good Ethiopian food in Seattle. Thank you very much Ralph, really appreciate your suggestions. Hope you’re doing well! Great to hear that Kim and G. Thanks! Mark, a wonderful mix of all kinds of food. You really know how to pick them! Now, I have to go to New York!! I love the variety that you chose to introduce. Just like the city! It really is a melting pot isn’t it. What is a double at Gloria’s?? The Ethiopian platter looks just amazing. What are the names of those dishes? Is that how a plater is there?? Foods when I travel someday in New york city. Thanks for another amazing food blog. Thank you very much Cliff, really appreciate it. Hey Pamela, great to hear from you, thank you very much. A double is some kind of a little fried dough sandwich. 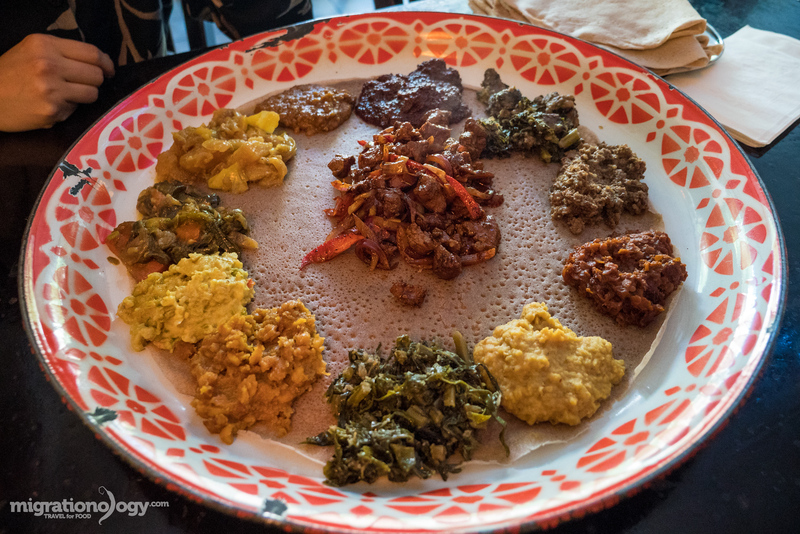 For the Ethiopian platter, they have a mix of dishes all assorted on a platter. But the meat dish is special tibs, and then there’s shiro wot (chickpea stew). Of the different dishes, I like the Spicy chicken with noodles at Spicy village, the lamb noodles at Xian and of course the deli at Katz. I can see these dishes are unique on their own, not often made with hand made noodle (lots of work if done right), and of course the smoke meat at Katz is finger licking good. Thanks for another great blog. Thank you very much Harry! Oh my goodness…I’m writing down the addresses and making a list! Those tacos!!! Mmmm! So jealous Mark…New York has been on my bucket list for a long long time! Thanks for this! Very cool to hear that, thank you Maylee, and hope you have a great food trip to New York City in the future. I’ve read the full blog and thanks for the precise details and colorful photos. About cakes and cocktails any news in NYC? Anyhow thanks for this review. Best. Thank you Silvato. Unfortunately I didn’t really do any research on cakes and cocktails, but there are so many available. Hi Mark, my mouth is watering!!!! Your wonderful presentation makes the the food comes alive and it makes me want to go to NYC! Thank you very much Susan, really appreciate you reading. Awesome to hear you love spicy food Wiwik! Hey Mark, Great show and wonderful selections. I have been living in NYC for past 17 years and think this place is a great food heaven! 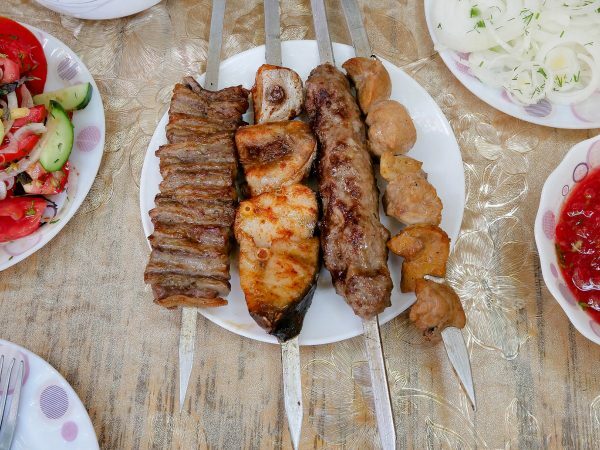 Being Originally from Iran, wondering if you ever going to travel to Iran and try some nice Persian Cousin? Hey Ali, awesome to hear from you, thank you for reading this blog post. Iran is one of my dream destinations, I would really love to visit, and hoping to make it happen at some point. Do you go back to visit often? Unfortunately I don’t go there that often and last time was 8 years ago, however I still have many good friends and family whom I can introduce you if you ever plan to visit. I do really hope you guys make it there! Cheers again for amazing blog. Very cool, thank you Ali! Hey Mark, thanks for your wonderful info. I will try it one day ..
Hi Rhonda, you’re welcome, thank you for reading! This is absolutely fantastic. Keep up the good work. And continue it. Hey Arthur, yah, I just didn’t have a chance to go there yet. Is it really good? One third of Americans are obese. I’d hope that you would be more interested in sharing with us healthy food alternatives that you can find in NYC. Processed cheese, food that contain exuberant amount of calories, food from a food truck which you don’t know where the servers wash their hands, are just not a good way to showcase NYC. How about Ippudo, Sri Praprai, Totto Ramen, Hide Chan Ramen, Lenwich, and Roti to name a few. Thanks for all your recommendations Jaiho! Hey Nat, thank you very much for your extra suggestions. I had Zabar’s on my list, but didn’t have time to make it there in the end, so thanks for recommending! 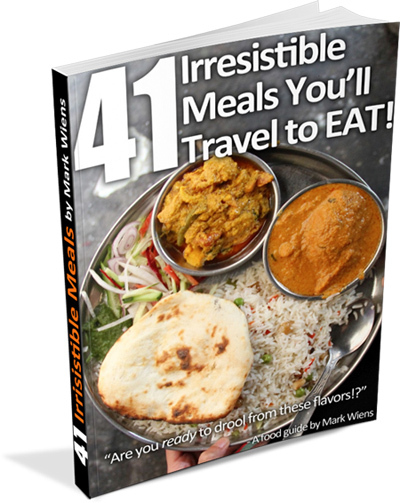 THANKS so much for the NYC Food Guide …. Think you and your wife must really have a Fun and Enjoyable time there ! As New York Is the biggest city in the world, there are so many many amazingly Many restaurants …that they say if you eat in restaurants each and everyday in different restaurants ( NEVER twice in the same restaurant ) in consecutive order ,….it will take you years and years or tens of years and you would not even finished all of them yet ! Amazing this adage / phrase is so good, if you could find the truth it would really be such a GOOD advertisement for New York City and all the restaurants there , right ? Hey Jenny, great to hear from you, thank you very much for the comment and e-mail. That’s very true, I think you could spend your lifetime discovering food in NYC! Just again YOU did it…really a good job, thank YOU for all your efforts to put this list together for ALL your readers…! Thank you very much Wolf! I used to go to a restaurant in Queens where I used to order pastrami on rye. I love pastrami. That’s my favorite. That sounds delicious Minda, thanks! I’d love to try Halal Guys, I’m told their food really is great! All the food on this blog looks amazing. Hi Mark, Love your video and congrats on the new baby:-). Sorry to Disagree on one NYC restaurant “Katz” Deli. The food is great but the people who work there are unbelievably rude. I am a New Yorker and was born and raised in Manhattan. We had a horrible experience with a waiter there who did all he could to make our experience miserable. * threw the food at us spilling it everywhere. There are many other great deli’s in NYC but Katz’s is not one of them. Never again. Hey Claude, thank you for sharing your experience. I think one of the reasons I had pretty good service is because I went early, literally right as they opened, my wife and I were first in the restaurant, so our server was friendly and wasn’t stressed out. But that’s very unfortunate. Hey Kimberly, sounds good, hope you enjoy your time in NYC and enjoy the food. Wow! It looks incredible! As always, perfect post Mark! Clear and easy to get! Can’t wait to get back to New York one day! Thank you very much Hiroko! Mark! We are making an unexpected trip to NYC after being away for more than eight years. I love following your posts all over the world and we have planed to follow your footsteps in Bangkok August 2017. I couldn’t believe the irony when I got your post today about NYC. 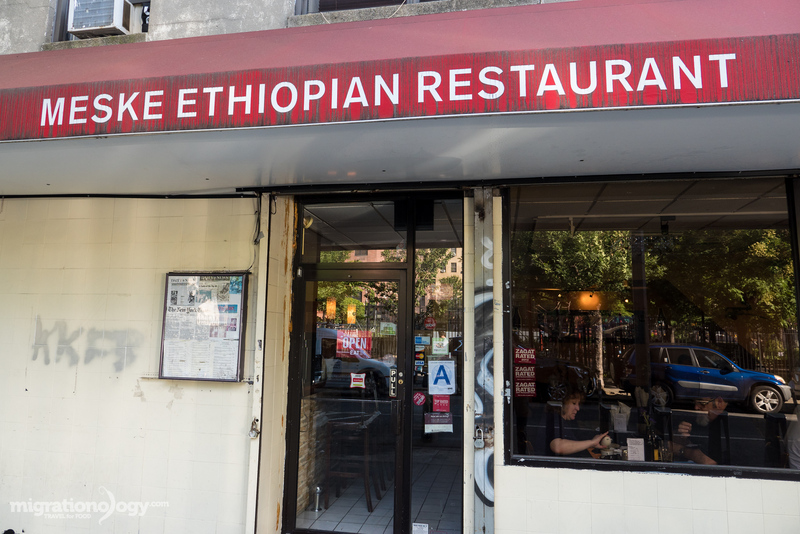 My highlight in NYC is going to be ETHIOPIAN FOOD and not just any Ethiopian food, my all time favorite is Meske!!! You have it on your top TEN! I laughed out loud when I saw it on your list. I have had Ethiopian cuisine all over the US. Every time we are in a cosmopolitan area I seek out Ethiopian food. And hands down Meske is the best! (Lalibela runs second place in Dallas, TX). Meske’s injera is spongy, soft, warm, and most of all tangy. My tastebuds are tingling at the thought. December 17th can’t come soon enough. Thanks for your post wishing you and your family many more happy culinary adventures! Hey Karla, awesome that you’ll be going back to NYC soon. Haha, that is fantastic that your favorite Ethiopian restaurant in NYC is Meske. My good friend, who I grew up with in Kenya brought me there, and it was delicious. Hope you have a great upcoming trip! Thank you Mark, those are my kind of foods. You got the good taste. Definitely love it. Have a fantastic time always. Several of these restaurants made me drool a little. Makes me want to impose upon some friends who live in the greater New York area. Ha! My girlfriend and I joke about how if teaching in Thailand doesn’t work out, we would get a food cart/moped and sling Mexican food. Was gonna call it Farang Food. Sell fresh made tacitos and horchata as the ingredients are available year-round. Hey Jeremy, thank you very much for reading. That’s actually an awesome idea, Mexican food cart in Bangkok serving proper tacos… oh man I would love that! Great mix of different ethnic foods and classic New York eats! I’ve done the $20 Katz sandwich and although it was good, I’ll probably not go back. And great to know about Xi’an Foods. 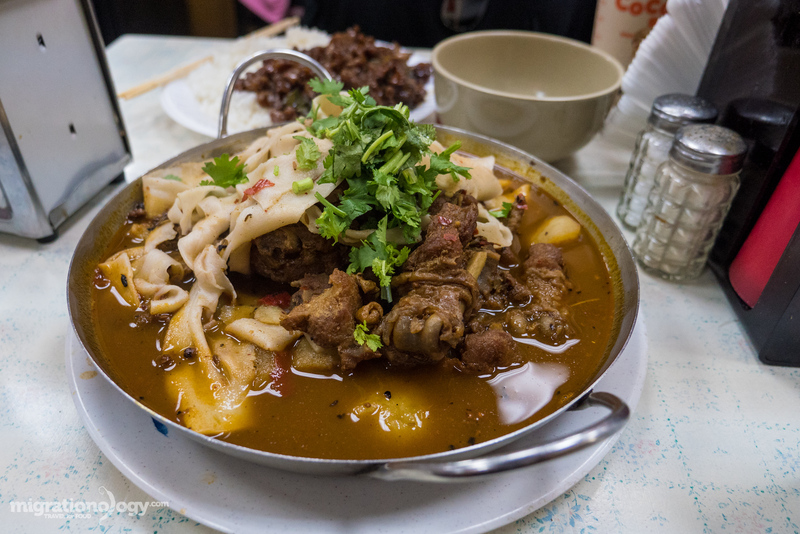 You can’t go wrong by heading out to Flushing to eat! Hey Stephen, thank you very much. Yah, that price is steep, and I agree, it’s not somewhere to go frequently. Hope you’re doing well! Solid list! Highly recommend the square slice at Di Fara next time you’re around. The pepperoni square is the best slice of pizza I’ve ever had. Thanks for all the guides and content – super helpful! Hey SP, thank you very much. I’m slightly regretting that I didn’t get a square slice as well, I got a little nervous in line waiting for the pizza and didn’t know what to do, so finally just went with the classic round. But next time I’ve for sure trying that square. Thank you so much for taking all of us on this culinary adventure around the world! Big fan of your channel! As a New Yorker, you managed to eat at a bunch of legendary places, that even I haven’t been to. If you ever go back to NYC, and you’re hungry for an excellent and authentic pizza, check out Motorino. Safe travels, and happy eating! Hey Olivia, you’re welcome, thank you for your support. Great, I appreciate the recommendation, will hope to visit NYC again in the future. Hi Mark, thks so much for the listing of places to eat. I will definitely followup on the others. You’re welcome, thank you for reading Sharon. Oh, Halal Guys! That sauce! It’s divine. They have a new shop, 14th and 1st. Now I just have to try the other nine. Cool, thanks for letting me know Yvonne. Yah, it’s all about their sauce. Good Sunday morning Mark, Ying and Micah. I was pleasantly surprised when I clicked on your Sunday email and saw you were recently in NYC. Sorry I missed You! Being from NJ the first 33 years of my life and now spent the past 27 years in the food wasteland of Charlotte NC, I am quite familiar with the wonderment and see if the diverse foods in the City. I actually was head short order cook for Katz NY in Charlotte (NOT related to the NY deli) and supposedly made the best Reuben in Charlotte. I would suggest on your bagel next time to add some smoked whitefish salad. Tomato belly lox and red onion yummy! I don’t eat that type of food anymore, so what really piqued my interest was your Chinese (still searching for authentic sichuan) and middle Eastern. Ny is probably the closest I’ll ever to authentic ethnic food. I’ve heard that NJ has outstanding Portugese food tho I never ate it. Lastly, thank you for the suggestion on Ethiopian food. That is one cuisine I have not tried. There’s a restaurant here in Charlotte called “Red Sea” I will have to try, but my obsession remains with thai, Vietnamese, Korean and middle Eastern. Thank you for the joy you bring to your vlogs that shines through and your love and respect for others. Hi Patricia, thank you very much for reading this post and for sharing. That’s awesome that you enjoy ethnic, especially Asian foods so much. 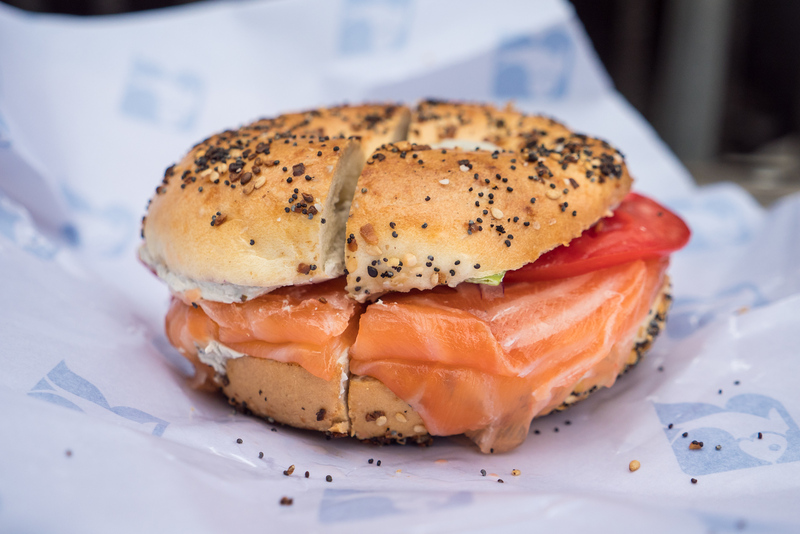 Thanks for the suggestion for the bagel and tomato belly lox, that sounds amazing. I will have to wait for next trip to NYC to try that. Thanks again for your kind words, hope you’re doing well! I have tried the chicken over rice at halal guys. Will try other dishes as i travel NY next time. Thank you very much Saroj. Thank you, I always look forward to your next video. Please be careful on your tour . Once again great video. Hey Mark, another nice job. I like how your list is comprised of food that is generally accessible to everyone and I think your list is solid. There are so many great places to eat in NYC that it is hard to go wrong. I do agree with Monty though, hopefully next time you can have a visit to Queens. As a native New Yorker, I think there are tons of opportunity there waiting to be explored. Wish you safe travels. Hey Anna, thank you very much. I did make go to Flushing one day, which was amazing, but I know there is so much more to eat in Queens. So much diversity and so much good food in NYC. Thank you again and hope you’re doing well. Hi Mark. 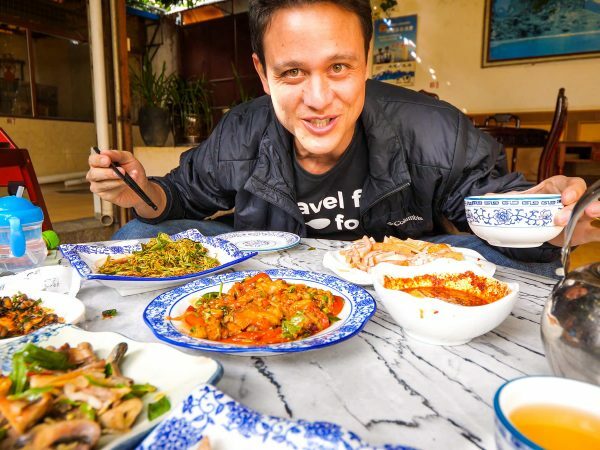 Love your videos and your passion for food and travelling. Hope the family especially the little guy is doing as well..
Having lived in NYC for 3 years those are definitely my top picks as well. Your content is great as always..Wish you all well and keep rocking :). Hey Petee, thank you very much, and great to hear you’re living in NYC. Thank you! You did NY right. I think nyc prices are reasonable compared to other places. You’re just used to ridiculously cheap food where people live in poverty. Thank you very much JB, yah that is true. Hi Mark thanks for visiting Spicy Vilage. I haven’t have the time to go back to Chinatown and it is a long wait getting a table in this small joint. I am glad u enjoyed it. Take care and God bless your stomach to eat more . That is a great list I don’t think I can stomach that much food anymore . Hey Monty, thank you. Spicy Village was absolutely awesome, a little gem of a restaurant and that big tray chicken was amazing. Hope you’re doing well. So nice mark i really impressed york work. But i do not like spicy foods to much. btw, Ying/Mark, congratulations, WOW, y’all be mommy/daddy now..a BIG step in y’alls life and we know your offspring will be a culinary genius, like Mom and Dad are! Your videos and y’all being So nice to everyone you meet is so refreshing and along with the food vlogs, keeps us hooked! Hey Gary, great to hear from you, thanks for sharing these Tucson spots. Those Sonoran hot dogs look amazing. Thank you very much, we are so excited to be parents – a little change of life, but couldn’t be happier. Hope you’re doing well also! 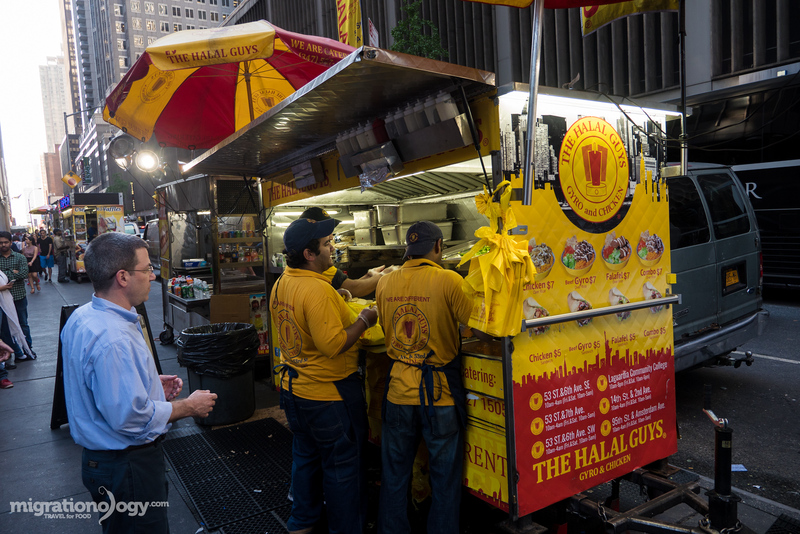 The Halal Guys serving is ‘Awesomely Epic’. Did you finished them? Street food is always good…????????. Love all the reviews. Thank you Fred, yah it was good, especially that sauce. Good grief, how does anyone survive in New York City with those prices?! Hey Steven, yah eating out is pretty expensive in NYC. Hello Mark and Jing, I can’t tell you how much I enjoy your videos. I get to see the world through your eyes and it’s amazing. We will most surely travel to either Japan or South Korea in the near future since our daughter is planning on teaching there. I’m binge watching your videos to see what’s ahead. Thank you so much for all your work and your enthusiasm, I always need a snack while watching!! All the best for you and Micah, your beautiful baby boy, hugs from the Netherlands. Hi Anita, thank you very much. And that’s great news that your daughter is teaching in South Korea, hope you can go to visit her and enjoy some food as well. Thank you for your support! As a New Yorker, I think this list is very very solid. You did a great job here! Some of these are my go-to spots and others I’ve been slacking on getting to but have been on my list. I hope you were able to check out and eat through Queens too. Next time you’re in NYC, let’s eat! I’m @wandersauce and @chrisbetweensleep on Instagram or shoot me an email! Hey Chris, great to hear from you, thank you very much. So many more places I wish I could have tried, but this was a start. Sounds good, would be great to eat next time we’re in NYC. This is so eclectic, looks so delicious, I especially like the Russ & Daughter salmon on bagel Gravlax. It leaves me breathless to know how many places in the world you’ve been this year. So wonderful! Mark, it was so exciting to see come to New York.. I live in Boston and am always looking for Thai restaurants nearby.. I do love New York and can’t wait to check out some of these places you’ve been too. Do you think you’ll ever come to the Boston area sometime? Hi Marco, thank you very much, and good to hear you’re living in Boston. I visited Boston once when I was a kid a long time ago. I would love to visit again, but not sure when yet. Thank you for the best videos on YouTube I enjoy everyone of them. You allow us to travel the world with you and we enjoy the food through your description of the food. Your the best Mark and thanks to your wife for the excellent camera shots. Hi Tom, great to hear from you, thank you very much for your kind words and for watching our videos and reading the blog. Thank you! im still amaze with your food fotography skill..love this food list btw..keep it up mark! Thank you very much Kahlil!